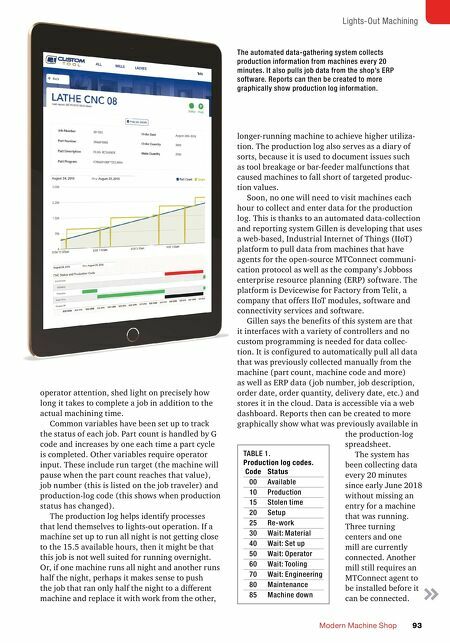 MMS NOVEMBER 2018 92 mmsonline.com AUTOMATION Automating Production Logging The production log Bob implemented in 2011 reveals how productive the shop's nine CNC machines and one robotic welding cell are each day by comparing daily planned work for each with actual production achieved. It also reveals how effectively the shop is making use of the avail- able overnight hours. Until recently, all this data has been collected manually. Each hour, employees such as Quinten Gass or Tracy Cogdell log part-production numbers hourly for each machine and enter those values as well as machine- status codes into the production log spreadsheet. The codes the shop uses for the production log are shown in Table 1. It strives to maximize the values of codes 10 and 15, representing produc- tion time during the shop's single day shift and unattended production time overnight, respec- tively. Comparing these values with expected daily production reveals true machine utilization, Bob says. Other codes, such as those for setup, rework and time waiting for material, tooling or Lights-out machining means a lot of parts are waiting for shop personnel when they arrive in the morning. For Custom Tool, this created an inspection bottleneck that spurred the shop to add an image dimension measurement device to speed part measurement for quality control personnel. 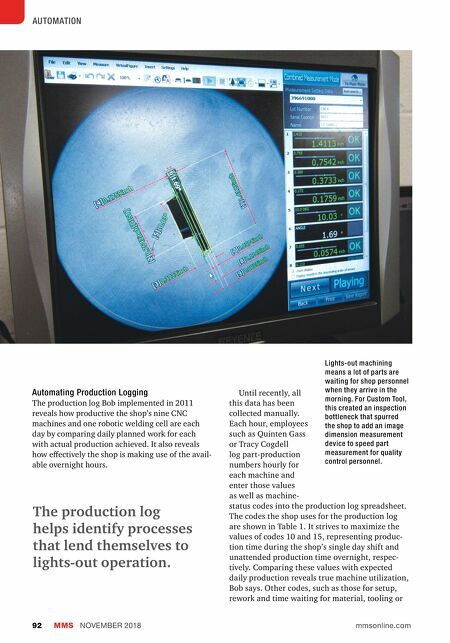 The production log helps identify processes that lend themselves to lights-out operation.